The ConChord Big Band made its debut in 1991 and is a 17 piece band plus vocalists playing swing, jazz, popular, movie and stage music. We are available to hire for, dances, weddings, theatre shows, concerts, festivals, public and private functions, in fact to audiences anywhere that appreciate a good band. The band is based in East Grinstead, West Sussex which is situated half way between London and Brighton. 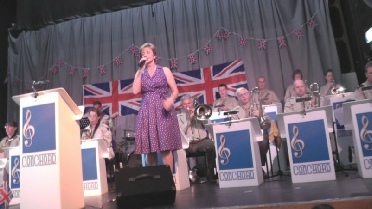 Apart from performing as a modern big band, ConChord is also available in the uniforms of the US Army Air Force Band playing the music of the iconic 40’s swing orchestras and singers (Glenn Miller etc). Whether you want a band for dancing or to listen to, the ConChord Big Band is the answer - we have a vast library of musical arrangements to play that suit most if not all situations and have more than 20 years experience in entertaining. Please get in touch if you have an event planned and we will be happy to discuss how we might add to the occasion and quote you for our services.